Many would argue that he wasn't the greatest American writer, or even the creator of the best American book. But Ernest Miller Hemingway certainly is the American writer, an undeniable collision of literary talent and iconic personality. He took Americans around the world with his new style of fiction, and he took fiction to new levels of pop culture status. More than a writer, he was the war hero, the war correspondent, the expatriate, the lion hunter, the marlin fisherman, the womanizer, the drinker, the overbearing ego, the tragic figure. Spurring him through life was a restlessness that never ceased, putting him in touch with a common humanity that populated his celebrated novels. "Almost every decade, he's in a new location. 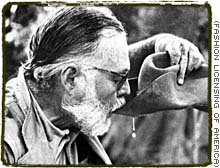 There's a totally new group of friends, and a certain number of sycophants, I think," says Dr. James Nagel, one of the world's leading scholars on Hemingway. At times, it's difficult to decipher where Hemingway's life and his legend part. But there is an overwhelming amount of information on his life. From his birth in Oak Park, Illinois, through the novels that were taken from his own experiences to his death at 62, Hemingway's life was thoroughly documented. Still, "there are questions about him that have never been answered and that's probably one reason we're still talking about him," says Redd Griffin, historian and board member of the Ernest Hemingway Foundation of Oak Park. "If you get too fixated on Hemingway, you lose the ability to understand him," says Michael Reynolds, author of several books on Hemingway's life. "He's like a deep well: you fall in and you may never come out." Read on for the story of how an innocent boy with an adventurous heart set out to become the most recognized writer of his time, the white-bearded man affectionately known as "Papa."